Purina Agribrands sponsored in part the Purina Barrel Stake class which was the held at Sunday evening show. Mid West was also fortunate to receive a $500 sponsorship from AQHA/CQHA which was split between the barrel stake class and western pleasure stake class. The AQHA/CQHA added money was payable to the top four winners of each stake class who were AQHA members. Only the top 20 fastest times from both barrel divisions who paid into the Barrel Stake in advance, were eligible for the Stake Class. A total of 61 horses paid in advance to participate in the stake class. The winner of the Barrel Stake class was Chris Blane and HeavensCashinDashin with a time of 16.169 seconds receiving $525 +$100 from AQHA/CQHA. Chris also received a cooler provided by Mid Western Ontario Horseman’s Society. A $50.00 gift certificate was also presented to Chris from ReRide of Dresden, Ontario. Reserve winner of the class was Arbon’s Frenchman shown by Kayleigh McKay with a time of 16.353 seconds receiving $437.50 +$75 from AQHA/CQHA. Third place winner was WhateverShe’sGot shown by Marg TenHove with a time of 16.406 seconds receiving $350+$50 from AQHA/CQHA. Fourth place winner was Down Home Legacy shown by Sierra White with a time of 16.410 seconds receiving $210+$25 from AQHA/CQHA. Fifth place winner was Deal A Run shown by Chris Blane with a time of 16.588 seconds receiving $140. Sixth place winner was Wild Rose shown by Glenn Sutherland with a time of 16.654 seconds receiving $87.50. A total of $2000 in prize money was presented to the top six winners. Another highlight of the Sunday evening show was Western Pleasure Stake class with 8 horses being shown. A total of 10 horses were eligible for the stake class. Champion of the class was Born Ready To Rock, shown by Jim Thomson receiving $150 + $100 from AQHA/CQHA. Jim also received a cooler provided by Mid Western Ontario Horseman’s Society. A $50.00 gift certificate was also presented to Jim from ReRide of Dresden, Ontario. Reserve of the class was One Hot Ta Molly shown by Sherry Fleischer receiving $125 + $75 from AQHA/CQHA. 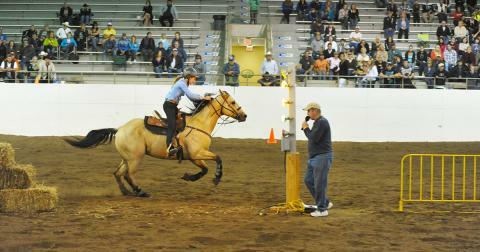 Third place was Dig This Machine shown by Carrie Vanass receiving $100+$50 from AQHA/CQHA. Fourth place was MMR Shot of Brandy shown by Chloe Moore receiving $60+$25 from AQHA/CQHA. Fifth place was Taylored By Tabu shown by Shelley Thomson receiving $40. Sixth place was BSB Dont Ask Me shown by Barb Boyd receiving $25. The winner of our Ranch Riding class held Friday evening was won by Shelley Thomson riding Taylored By Tabu. Shelley was presented with a blanket provided by Ken and Glenda McLellan. The winner of our Trail class held Sunday morning was Ken O’Donnell riding BSB Dont Ask Me. Ken was presented with a stall bag provided by All Trail Breed. The winners of the T shirts donated by Kicking Cowgirl were Cadence Nelson and Tiffany VanDenBerg. Also, worthy of mention were the 19 ponies who entered the show. WOW, what a sight that was to see when they all entered the ring after the keyhole class to be presented with gift bags provided by Jim and Shelley Thomson as well as apple treats provided by Avon Feeds. Many thanks go to our sponsors: Western Fair District for supporting the show, Purina Agribrands for sponsoring in part the Barrel Stake class, AQHA/CQHA for sponsoring in part the top four AQHA members who were winners of both barrel and western pleasure stake classes, Ken and Glenda McLellan for award for Ranch Riding class, Re Ride for two $50.00 gift certificates for Stake class winners, Avon Feeds for providing apple treats which were given out to various exhibitors. Also, Kicking Cowgirl for two T shirts which were presented to first place in Western Pleasure and Division 2 Keyhole. We would also like to thank Parkway Gardens for donating the beautiful fall planters. Big thank you goes to Ken O’Donnell & Ben DeBrouwer for providing the trail equipment for our trail class. Also thank you to All Breed Trail Challenge for added money to our Trail class as well as a stall bag. The continued support of our sponsors is greatly appreciated. Last but not least, we thank all of the exhibitors who participated in the show and the many volunteers who made this show such a great success. We couldn’t’ have done it without you.